Clients who are in abusive relationships often need help in gaining the courage to leave their partner. Abuse can be verbal, mental, physical or emotional - whichever type of abuse your client has been a victim of they will have undoubtedly suffered greatly in confidence and self-esteem - as well as the actual effects. This hypnosis script will help your client to devise their own plan of action and includes a strategy designed to help them stick with their plan should the perpetrator try to coax them to return. Abuse of any kind should not be tolerated and your client is right to seek help in escaping the torment. 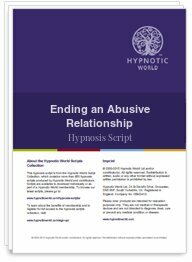 This Ending an Abusive Relationship script can help them to break away from being a victim of domestic abuse. Feel confident in a gay relationship.